At St. Thomas’ we regularly respond to the good news by throwing a party, which is of course what Jesus did repeatedly when he announced that the Kingdom of God has drawn near. The Spirit has made our community a family, and, as with any healthy family, everyone pitches in to help with the chores needed to celebrate properly. This is a great and easy way to get involved and to get to know others in our community. We’ve organized many teams. Simply choose one or many and let the team leader know you’re willing to serve when there’s a need throughout the year. They’ll schedule you at a time that works for you. This group is for families with children who are infants through 5th grade. We get together for monthly lunches at church! 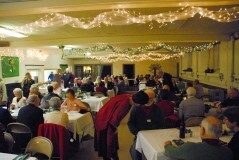 The Fellowship Ministry organizes the weekly coffee hours, the Fall Parish picnic, Clean-up lunches in the Fall and Spring, the Advent Roast Beef Dinner, the Christmas Eve Dinner, the Annual Meeting coffee hour, the Maundy Thursday Agape supper, as well as receptions that come up throughout the year. Cook for one or more church events during the year. Help decorate for one or more church events during the year. Wash dishes after one or more church events during the year. Working in teams of two, hospitality hosts set up for Sunday morning Coffee Hour, monitor supplies, and clean up afterwards. This normally consists of setting out food previously prepared and stored in our freezer, making coffee, and setting juice and cups. If you can set a table, learn to operate a coffee pot, and be a good host or hostess, this ministry is a simple and important way to serve on our worship team. Washing and ironing of table linens for church events during the year. The Breakfast Group, open to all, meets for breakfast on the second Saturday of the month for conversation. Bring an appetite, a sense of humor, and (optional) a dish to pass. A group open to all women who meet for lunch, fellowship and outreach projects.